The function of Arabidopsis enhanced disease susceptibility 1 (AtEDS1) and its sequence homologs in other dicots have been extensively studied. However, it is unknown whether rice EDS1 homolog (OsEDS1) plays a role in regulating the rice-pathogen interaction. In this study, a OsEDS1-knouckout mutant (oseds1) was characterized and shown to have increased susceptibility to Xanthomonas oryzae pv. oryzae (Xoo) and Xanthomonas oryzae pv. oryzicola (Xoc), suggesting the positive role of OsEDS1 in regulating rice disease resistance. However, the following evidence suggests that OsEDS1 shares some differences with AtEDS1 in its way to regulate the host-pathogen interactions. Firstly, OsEDS1 modulates the rice-bacteria interactions involving in jasmonic acid (JA) signaling pathway, while AtEDS1 regulates Arabidopsis disease resistance against biotrophic pathogens depending on salicylic acid (SA) signaling pathway. Secondly, introducing AtEDS1 could reduce oseds1 mutant susceptibility to Xoo rather than to Xoc. Thirdly, exogenous application of JA and SA cannot complement the susceptible phenotype of the oseds1 mutant, while exogenous application of SA is capable of complementing the susceptible phenotype of the ateds1 mutant. Finally, OsEDS1 is not required for R gene mediated resistance, while AtEDS1 is required for disease resistance mediated by TIR-NB-LRR class of R proteins. 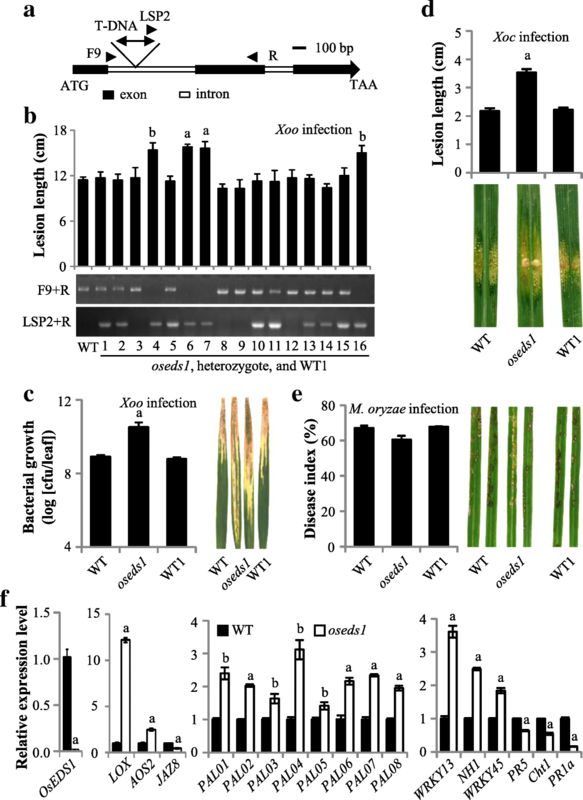 OsEDS1 is a positive regulator in rice-pathogen interactions, and shares both similarities and differences with AtEDS1 in its way to regulate plant-pathogen interactions. The online version of this article ( https://doi.org/10.1186/s12284-019-0283-0) contains supplementary material, which is available to authorized users. As sessile organisms plants have evolved sophisticated mechanisms and strategies in responding to biotic and abiotic stimuli and the ever changing environment. Typically, plant immune response to pathogens is initiated by plasma membrane localized pattern recognition receptors (PRRs)-mediated rapid sensing of pathogen-associated molecular patterns (PAMPs) that leads to PAMP-triggered immunity (PTI), or by cytoplasmic resistance (R) proteins-mediated recognition of microbial effectors that activates a strong disease resistance response: effector-triggered immunity (ETI) (Jones and Dangl 2006; Boller and Felix 2009; Zipfel 2009; Thomma et al. 2011). During these immune responses, plant hormones such as salicylic acid (SA) and jasmonic acid (JA) play important roles in mediating various subsets of defense response events (Spoel and Dong 2008). Both synergistic and antagonistic interactions between SA-dependent and JA/ethylene-dependent pathways exist in plant-pathogen interaction (Spoel and Dong 2008). Arabidopsis enhanced disease susceptibility 1 (AtEDS1), a pathogen and SA-induced defense responsive gene, encodes a lipase like protein and is required for a set of defense gene expression. It is also required for disease resistance mediated by some Toll–interleukin-1 receptor–nucleotide binding–leucine-rich repeat (TIR-NB-LRR) class of R proteins (Falk et al. 1999; Wiermer et al. 2005). AtEDS1 positively mediates ETI by directly interacting with TIR-NB-LRR type R proteins RPS4 and RPS6 to form the RPS4-AtEDS1 and RPS6-AtEDS1 complexes (Bhattacharjee et al. 2011). The cognate bacterial effectors AvrRps4 and HopA1 interact with AtEDS1 by disrupting RPS4-AtEDS1 and RPS6-AtEDS1 complexes and releasing RPS4 and RPS6, thereby activating ETI and AtEDS1-dependent basal resistance signaling pathway (Bhattacharjee et al. 2011). AtEDS1 functions in SA-dependent pathway by interacting with another lipase like protein, phytoalexin deficient 4 (AtPAD4), to promote SA biosynthesis in a positive feedback manner (Feys et al. 2001). AtEDS1/AtPAD4 mediates the SA-JA/ET signal antagonism as an activator of SA-dependent pathway but a repressor of JA/ET-dependent signaling (Wiermer et al. 2005; Brodersen et al. 2006). AtEDS1/AtPAD4 complexes antagonize JA/ET signal by interacting with MYC2 thereby reducing its binding to target gene promoter (Cui et al. 2018). Simultaneous over-expression of AtEDS1 and AtPAD4, but not individual over-expression of AtEDS1 or AtPAD4 leads to autoimmunity and enhanced disease resistance associated with increased SA levels and PR1 transcripts accumulation (Cui et al. 2017). In addition to Arabidopsis AtEDS1, its orthologs from other dicots such as Nicotiana benthamiana, Lycopersicon esculentum, Vitis vinifera, Glycine max, Gossypium barbadense and Cicer arietinum and from monocot Triticum aestivum also play positive roles in plant-pathogen interactions, suggesting a conserved role of EDS1 in plant-pathogen interactions (Liu et al. 2002; Peart et al. 2002; Hu et al. 2005; Gao et al. 2010a; Wang et al. 2014; Yan et al. 2016; Chakraborty et al. 2018; Chen et al. 2018). Furthermore, Lycopersicon esculentum LeEDS1 is required for both TIR-NBS-LRR class resistance (R) genes Bs4 and N, and LRR receptor class R genes Ve1 and Ve2 mediated gene-for-gene resistance (Hu et al. 2005); Cicer arietinum CaEDS1 is required for coiled-coil (CC)-NBS-LRR class R gene CaRGA mediated gene-for-gen resistance (Chakraborty et al. 2018). However, it is not clear whether rice EDS1 ortholog, OsEDS1, is also involved in the rice-pathogen interaction. Xanthomonas oryzae pv. oryzae (Xoo) and Xanthomonas oryzae pv. oryzicola (Xoc) which are two close related pathogens cause rice bacterial blight and rice bacterial leaf streak (Niño-Liu et al. 2006). All two diseases are highly devastating and cause heavy yield losses worldwide. Rice defense-responsive genes are involved in various resistance mechanisms mediated by the JA-dependent pathway, SA-dependent pathway, both JA- and SA-dependent pathways, or both JA- and SA-independent pathway (Qiu et al. 2007; Tao et al. 2009; Fu et al. 2011; Shen et al. 2011; Deng et al. 2012; Ke et al. 2014 and Ke et al. 2017a). In this study, we functionally characterized OsEDS1 for its role in the rice-bacteria interactions by a combination of genetic, molecular, physiological and pathological analyses. These analyses suggest that OsEDS1 positively regulates rice defense response against Xoo and Xoc in a JA-dependent manner, which is different from the SA-mediated role of AtEDS1 in Arabidopsis disease resistance. In Arabidopsis, AtEDS1 interacts with AtPAD4 and acts as an essential component in the pathogen-induced defense response (Parker et al. 1996; Falk et al. 1999; Feys et al. 2001). To identify the rice EDS1 ortholog, the amino acid sequence of AtEDS1 (accession number: NP_190392) was used to BLAST against the rice genome database. An amino acid sequence (accession number: NP_001063086) encoded by the gene with locus name LOC_Os09g22450 was found and shown to share the highest sequence similarity with AtEDS1. This gene was named as OsEDS1, which is a single copy gene in rice genome. OsEDS1 and AtEDS1 share 37% sequence identity and 51% sequence similarity. The most similar regions between OsEDS1 and AtEDS1 are the predicted lipase region that covers approximately 215 amino acids (45% sequence identity and 60% sequence similarity) and harbors the catalytic triad of lipase with the conserved serine (S), aspartate (D), and histidine (H) residues (Additional file 1: Figure S1) (Brady et al. 1990). 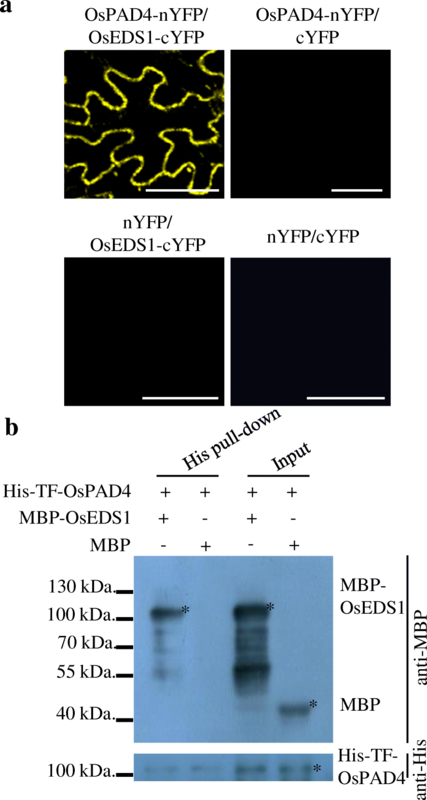 To detect whether OsEDS1 directly interacts with the membrane-localized OsPAD4 as the case of AtEDS1 and AtPAD4 in Arabidopsis, bimolecular fluorescence complementation (BiFC) assays were performed by transient expression of both OsEDS1-cYFP and OsPAD4-nYFP in plant cells. The YFP signals indicated that OsEDS1 interacted with OsPAD4 at the plasma membrane (Fig. 1a; Additional file 1: Figure S2). OsEDS1 also interacted with Arabidopsis AtPAD4 protein in cytoplasm, whereas OsPAD4 interacted with AtEDS1 at the membrane (Additional file 1: Figure S2). In addition, the protein pull-down assay was successfully performed using MBP-OsEDS1 and His-TF-OsPAD4 proteins, demonstrating their interaction in vitro (Fig. 1b). These in vitro and in vivo analyses suggested that OsEDS1 likely interacts with OsPAD4. We initially isolated OsEDS1 T-DNA insertion mutant RMD_03Z11KT37 from rice T-DNA insertional library in Geng variety Zhonghua 11 (ZH11, susceptible to Xoo strain PXO112) (Zhang et al. 2006; Cao et al. 2007). The genomic sequence of RMD_03Z11KT37 was characterized using the gene-specific and T-DNA primers and shown to have a T-DNA insert in the first intron of OsEDS1 (Fig. 2a). In addition, the mutant progeny with homozygous, heterozygous, or wild-type OsEDS1 mutation genotypes were obtained by genetic segregation from RMD-03Z11KT37 plants (Additional file 1: Figure S3). These plants showed no obvious phenotypic changes during the developmental stage. The OsEDS1 transcripts were detected in the WT, insert-negative segregant, and heterozygous OsEDS1 mutant plants, but not in the homozygous T-DNA mutant (Additional file 1: Figure S3). These results confirm that homozygous RMD_03Z11KT37 is an OsEDS1-knockout mutant, which was referred to as oseds1. To determine whether OsEDS1 is involved in the rice-pathogen interaction, we inoculated oseds1 mutant with Xoo strain PXO112 at the booting (panicle development) stage. The homozygous oseds1 mutant showed increased susceptibility to Xoo compared to heterozygote, WT, and WT sibling plants (Fig. 2b). The growth rate of PXO112 on oseds1 leaves was significantly higher than that on WT and WT siblings at 12 days after inoculation. The amount of bacteria in oseds1 was 18.5- and 20.1-fold higher than that in WT and WT sibling plants, respectively (Fig. 2c). Considering the closed relatedness of Xoo and Xoc, we then inoculated oseds1 plants with Xoc strain RH3 at tillering stage. Results showed that oseds1 plants were more susceptible to Xoc with the lesion length was 3.5 cm for oseds1 versus 2.2 cm for WT and WT sibling plants (Fig. 2d). Like Xoo and Xoc, Magnaporthe oryzae (M. oryzae) is another (hemi) biotrophic pathogen. Previous studies have shown that some genes contribute rice resistance to all these three pathogens, such as WRKY45 (Tao et al. 2009). To check whether OsEDS1 play a role in rice-M. oryzae interaction, we inoculated oseds1 mutant with M. oryzae isolate Enshi2–2 (N2–2) at one-month-old seedlings. Result showed that oseds1 mutant had a similar level of susceptibility relative to WT and WT sibling plants (Fig. 2e). These results suggest that OsEDS1 might act as a positive regulator in rice resistance to X. oryzae but not to M. oryzae. To dissect possible defense pathways mediated by OsEDS1, we analyzed the expression of a set of rice defense-responsive genes in the oseds1 mutant. These include LOX (lipoxygenase; D14000) and AOS2 (allene oxide synthase 2; AY062258) involved in JA biosynthesis, JAZ8 (jasmonate ZIM-domain protein; XP_015612402) related to the JA-dependent signaling pathway (Peng et al. 1994; Mei et al. 2006; Yamada et al. 2012; Ke et al. 2014), PAL (phenylalanine ammonia lyase) genes involved in the phenylpropanoid pathway and SA biosynthesis (Duan et al. 2014), WRKY13, NH1 (rice NPR1 homolog 1) and OsWRKY45 associated with SA-dependent signaling pathway and Xoo resistance (Qiu et al. 2007; Tao et al. 2009; Yang et al. 2013), as well as pathogenesis-related protein (PR) genes such as PR1a (for acidic pathogenesis-related protein 1; AJ278436), PR5 (for class 5 pathogenesis-related protein; P28493) and Cht1 (for chitinase 1; Q42993) (Xiao et al. 2009; Shen et al. 2010; Deng et al. 2012; Ke et al. 2014). The expression levels of LOX, AOS2, PALs, WRKY13, NH1 and OsWRKY45 were significantly higher in oseds1 mutant than those in WT. By contrast, the expression levels of PR5, Cht1, PR1a, and JAZ8 were significantly lower in oseds1 mutant than those in WT (Fig. 2f). These results suggest that increased susceptibility of oseds1 may be associated with impaired JA-related signaling pathways. The serine residue at position 143 of OsEDS1 protein and position 123 of AtEDS1 protein is embedded within the GHSSG sequences (Additional file 1: Figure S1) that resemble the GXSXG (X representing any amino acid) motif of eukaryotic lipases catalytic triad (Brady et al. 1990; Wagner et al. 2013). The conserved serine residue of predicted catalytic triad of lipase in OsPAD4 and AtPAD4 is also embedded in the motif similar to GXSXG (Additional file 1: Figure S1). To further verify that the increased susceptibility to Xoo and Xoc was caused by the mutation of OsEDS1, the wild type OsEDS1 cDNA driven by OsEDS1 native promoter (EWT) and mutated OsEDS1S143L cDNA driven by OsEDS1 native promoter (ES143L) were introduced into the oseds1 mutant by the Agrobacterium-mediated transformation, resulting in 15 independent T0 plants for EWT, and 21 independent T0 plants for ES143L. The T1 transgenic plants from five selected T0 plants (EWT-2, EWT-4, ES143L-9, ES143L-15) and empty vector (negative control, NC), were used for further analyses. The EWT-2, EWT-4, ES143L-9, and ES143L-15 plants showed similar levels of OsEDS1 expressions to WT (Fig. 3a). These plants were significantly less susceptible to Xoo and Xoc than that of oseds1, and exhibited a similar level of susceptibility as the WT plants (Fig. 3a; Additional file 1: Figure S4a). Consistent with the disease assay, the expression of PR1a, PR5 and JAZ8 was significantly higher in EWT and ES143L plants than in oseds1 and NC plants (Fig. 3b). These results demonstrated that OsEDS1 was the gene responsible for the mutant phenotype of oseds1. However, the conserved S143 residue appeared not required for the OsEDS1–mediated rice-X. oryzae interactions. Rice OsPAD4 functions differently from Arabidopsis AtPAD4 in plant-bacteria interactions (Ke et al. 2014). To study if AtEDS1 and OsEDS1 have a similar function in plant-pathogen interactions, the AtEDS1 cDNA driven by OsEDS1 native promoter (EAt) was transformed into the oseds1 mutant. Twenty-six independent transgenic T0 plants, EAt-1 to EAt-26, were obtained and verified. The positive plants of EAt-11 and EAt-16 were used for further analyses. The EAt plants were significantly less susceptible to Xoo than that of oseds1 and exhibited a similar level of susceptibility as the WT plants (Fig. 4a; Additional file 1: Figure S4b). Consistently, the expression levels of JAZ8, PR5 and PR1a in EAt plants were significantly higher than those in oseds1 mutant (Fig. 4b). However, the EAt plants had a similar level of susceptibility to Xoc relative to oseds1 mutant (Fig. 4a; Additional file 1: Figure S4b). These results suggest that AtEDS1 could partially complement oseds1 mutant phenotype. In Arabidopsis, AtEDS1 is required for TIR-NBS-LRR class R genes RPP1, RPP5 and RPS4 mediated gene-for-gene resistance (Parker et al. 1996, 2000; Gassmann et al. 1999). In Lycopersicon esculentum, LeEDS1 is required for both TIR-NBS-LRR class R genes Bs4 and N, and LRR receptor class R genes Ve1 and Ve2 mediated gene-for-gene resistance (Hu et al. 2005). There is no TIR-NB-LRR-type R gene for resistance to Xoo has been identified in rice, and no R gene for resistance to Xoc has been cloned. To ascertain whether OsEDS1 plays role in R gene-mediated resistance, we crossed transgenic MKbZH1 line with oseds1 mutant. MKbZH1 is carrying transgenic R gene Xa3/Xa26 with the genetic background of ZH11 (Cao et al. 2007). Xa3/Xa26, encoding an LRR receptor kinase-like protein, confers race-specific resistance to Xoo including to strain PXO112 (Cao et al. 2007; Gao et al. 2010b; Li et al. 2012). 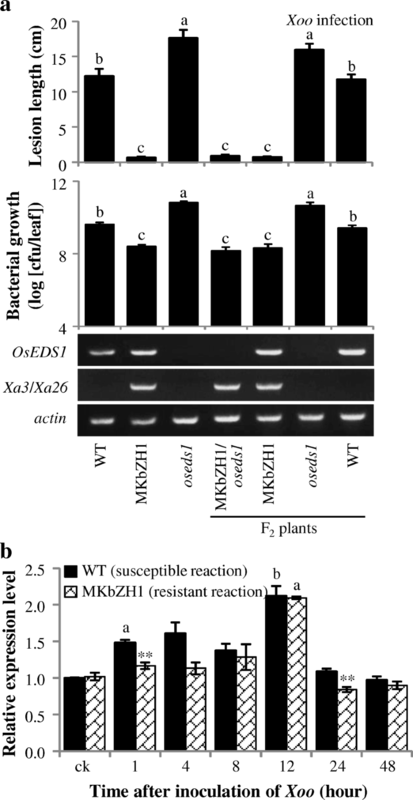 The F2 plants (MKbZH1/oseds1) carrying Xa3/Xa26 showed similar lesion length and similar bacterial growth with parental plant MKbZH1 (Fig. 5a). The above results were consistent with the similar expression patterns of OsEDS1 in resistant MKbZH1 line and susceptible ZH11, in general. OsEDS1 expression level was slightly increased during Xoo infection with 12 h having higher expression in both resistant and susceptible reactions, and ZH11 accumulated less OsEDS1 transcripts at 1 and 24 h (Fig. 5b). These results suggested that OsEDS1 was not involved in Xa3/Xa26–mediated resistance to Xoo. In Arabidopsis, AtEDS1 expression can be induced by exogenous SA application. AtEDS1 expression is also required for pathogen induced SA accumulation and ateds1 mutant fails to accumulate SA after pathogen infection (Feys et al. 2001). However, EDS1 homologs expression was not induced by exogenous SA application in monocot plants barley and wheat (Gaudet et al. 2010). Exogenous application of SA did not induce OsEDS1 expression, but the exogenous application of JA induced OsEDS1 expression at 1, 3 and 6 h after treatment (Additional file 1: Figure S5). oseds1 mutant had significantly higher SA content than WT both before and after Xoo infection, but Xoo infection did not further increase SA content (Fig. 6a; Additional file 1: Figure S6a). The oseds1 mutant also had significantly higher JA content than WT before and after Xoo infection and Xoo infection further increased JA content (Fig. 6a; Additional file 1: Figure S6a). However, oseds1 mutant accumulated less jasmonyl-L-isoleucine (JA-Ile, the most biologically active JA compound) content than WT before and after Xoo infection (Fig. 6a). Additionally, the expression levels of two JA-Ile synthases genes OsJAR1 and OsJAR2 (Wakuta et al. 2011; Hui et al. 2019) and PR5, PR1a, and JAZ8 were induced after Xoo inoculation in both WT and oseds1 mutant plants, with the expression levels of these genes were higher in WT than those in oseds1 (Fig. 6b; Additional file 1: Figure S6b). We further analyzed the response of oseds1 mutant to exogenous application of SA and JA. 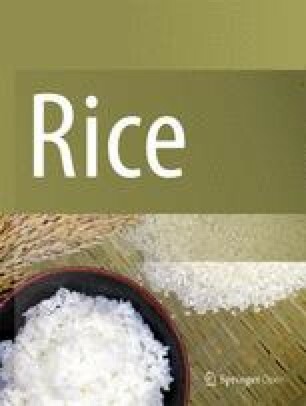 Exogenous application of JA was shown to induce rice resistance to Xoo (Yamada et al. 2012; Ke et al. 2014). Exogenous application of SA may induce rice resistance to Xoo in some situation (Song et al. 2001; Xu et al. 2013), but not in other cases (Ke et al. 2014). In WT plants, bacterial blight disease was significantly less severe after JA treatment in comparison with mock treatment, whereas a similar level of the disease was observed in SA- and mock-treated plants (Fig. 6c). However, exogenous application of either JA or SA did not reduce the susceptibility of oseds1 mutant to Xoo, as judged by the similar lesion length and pathogen growth observed in JA- or SA-treated vs. mock-treated oseds1 plants (Fig. 6c). Nevertheless, exogenous application of JA increased PR1a and JAZ8 gene expression and exogenous application of SA increased PR1a and PR5 gene expression in both oseds1 and WT plants with the expression levels of these genes being higher in WT than in oseds1 (Additional file 1: Figure S7). The impaired PR5 and PR1a expression in oseds1 might be caused by the impaired JA signaling. These results supported that OsEDS1 may function downstream of JA- biosynthesis in JA-dependent signaling pathway. EDS1 is a putative triacylglycerol lipase. The positive roles of AtEDS1 and other dicots EDS1s in plant resistance response have been extensively studied (Falk et al. 1999; Liu et al. 2002; Peart et al. 2002; Hu et al. 2005; Wiermer et al. 2005; Gao et al. 2010a; Wang et al. 2014; Yan et al. 2016). The present study showed that rice oseds1 mutant increased susceptibility to X. oryzae compared to WT, suggesting that OsEDS1 positively regulates rice defense resistance to X. oryzae. Rice OsEDS1 was a sequence ortholog of Arabidopsis AtEDS1. OsEDS1 and AtEDS1 interacted with AtPAD4 and OsPAD4, respectively. Both AtEDS1/AtPAD4 and OsEDS1/OsPAD4 mediated plant basal resistance in plant (Fig. 2b-d) (Feys et al. 2001; Ke et al. 2014). Arabidopsis AtEDS1 and AtPAD4, as well as rice OsEDS1 and OsPAD4 all contained the GXSXG motif of eukaryotic catalytic triad lipases (Additional file 1: Figure S1; Brady et al. 1990). However, the lipase activity of plant EDS1 and PAD4 has not yet been verified. The predicted lipase catalytic triad residues of EDS1 and PAD4 contain Ser (S), Asp (D), and His (H) in rice and Arabidopsis (Additional file 1: Figure S1) (Wagner et al. 2013; Ke et al. 2014; Cui et al. 2018). Mutation of the conversed residue S of GXSXG motif in AtEDS1 or AtPAD4 does not compromise the basal immune response (Louis et al. 2012; Wagner et al. 2013). The predicted lipase regions of OsEDS1 and AtEDS1 have 60% sequence similarity and mutation of the conversed residue S of GXSXG motif in OsEDS1 also did not compromise the basal immune response (Fig. 3a; Additional file 1: Figures S1 and S4). However, the mechanisms underline OsEDS1 and AtEDS1 mediated plant-pathogen interactions may have both similarities and differences. This hypothesis is based on the following evidence. Firstly, mutation in OsEDS1 compromised PR5, JAZ8 and PR1a expression; introducing OsEDS1 and AtEDS1 to oseds1 mutant, complemented their expression. Secondly, oseds1 mutant was more susceptible to Xoo and Xoc; while the introduction of AtEDS1 reduced the susceptibility of oseds1 mutant to Xoo rather than Xoc. Thirdly, OsEDS1 modulated rice-X. orzyae interactions by antagonistically affecting SA-JA-related signaling pathway, as a repressor of SA-dependent and an activator of JA-dependent, and exogenous application of SA and JA cannot complement susceptible phenotype of oseds1 mutant; while AtEDS1 regulates Arabidopsis-pathogen interaction by antagonistically affecting SA–ET/JA interaction, as an activator of SA-dependent and a repressor of ET/JA-dependent, and exogenous application of SA can complement susceptible phenotype of ateds1 mutant. (Falk et al. 1999; Wiermer et al. 2005; Brodersen et al. 2006; Cui et al. 2018). Fourthly, OsEDS1 physically interacted with OsPAD4 which mediates the rice-bacteria interactions via the JA signaling pathway (Ke et al. 2014), while AtEDS1 associates with AtPAD4 which enhances Arabidopsis resistance to pathogens by activating SA signaling pathway and suppressing ET/JA-dependent pathway (Cui et al. 2017). Finally, there is no TIR-NB-LRR-type R gene for resistance to Xoo has been identified in monocots, and no R gene for resistance to Xoc has been cloned in rice. OsEDS1 was not required for LRR receptor class R gene Xa3/Xa26 mediated resistance to Xoo (Cao et al. 2007; Liu et al. 2018), while AtEDS1 is required for disease resistance mediated by TIR-NB-LRR class of R proteins (Falk et al. 1999; Wiermer et al. 2005). Although the closed relatedness of Xoo and Xoc which belong to the same species and are both biotrophic pathogens, they have different pathogenic mechanisms. Xoo invades rice plants through hydathodes or wounds and multiplies in the intercellular spaces then enter into and spread through the xylem. Xoc penetrates the leaves of rice plants through stomata and wounds and multiplies in the substomatal cavity and then colonizes the intercellular spaces of the parenchyma and mesophyll cells (Niño-Liu et al. 2006). OsWRKY45–2 and OsMPK6 promote rice resistance to both Xoo and Xoc (Tao et al. 2009; Shen et al. 2010). OsMPK3 which plays a negative role in the rice defense against Xoo was not involved in rice resistance to Xoc infection (Xiong and Yang 2003; Ma et al. 2017). Our present study showed that oseds1 was more susceptible to Xoo and Xoc, and introducing AtEDS1 could reduce oseds1 susceptibility to Xoo, but not to Xoc. Thus, the mechanisms underline rice defense against Xoo and Xoc may have both similarities and differences. JA originates from α-linolenic acid of chloroplast membranes by oxidative processes (Wasternack and Song 2017; Wasternack and Strnad 2018). Consequently, JA perception takes only upon formation of JA-Ile which is catalyzed by JA-Ile synthase (Fonseca et al. 2009). Following JA-Ile sensed by the co-receptor COI1 (coronatine insensitive 1)/JAZ, the JAZ repressor is de-repressed via COI1-mediated ubiquitination and 26S proteasomal degradation which results in releasing of the transcription factors and binding to the promoters of JA-responsive genes. Plant defense response requires intact JA signaling (Kazan and Manners 2013). The analysis of the endogenous level of JA, the expression of JA responsive genes and the sensitivity to exogenous JA clearly showed that mutation in OsEDS1 impaired JA-Ile synthetic enzyme genes OsJAR1/2 expression resulting in less JA-Ile accumulation downstream of JA biosynthesis in JA-related signaling pathway. In Arabidopsis, atjar1 and atmyc2 mutants reduce sensitivity to JA and activate SA biosynthesis (Nickstadt et al. 2004; Laurie-Berry et al. 2006). In oseds1 mutant, the activated SA biosynthesis and SA signaling may cause by reduced JA-Ile level. Constitutively high level of SA may alter the sensitivity of downstream signaling components to SA (Chen et al. 1997). In Arabidopsis, defense against biotrophic pathogens is SA-dependent, while defense against necrotrophic pathogens is JA-dependent (Robert-Seilaniantz et al. 2011). In rice, benzothiadiazole (SA analog) and JA can induce resistance against both biotrophic and necrotrophic pathogens (De Vleesschauwer et al. 2013). Clearly, the defense model of defense hormones SA and JA in rice is strikingly different form that in Arabidopsis. Like AtEDS1, OsEDS1 can positively regulate rice disease resistance. OsEDS1 and AtEDS1 have both similarities and differences in their way to regulate plant-pathogen interactions. However, the mechanism underlying OsEDS1 regulated SA- and JA- related signaling pathway could not be exhaustively addressed in the present work. Thus, further studies are needed to focus on resolving the mechanism of OsEDS1-mediated defense in rice may provide further insight into this perspective. The amino acid sequence of Arabidopsis AtEDS1 (accession number of protein database in National Center for Biotechnology Information [NCBI; http://www.ncbi.nlm.nih.gov]: NP_190392) was used to identify its ortholog from rice genome database (http://blast.ncbi.nlm.nih.gov/Blast) by the BLASTP program (Altschul et al. 1997). The rice amino acid sequence NP_001063086 (gene locus LOC_Os09g22450) showed the highest sequence identity to AtEDS1. The genomic sequence of LOC_Os09g22450 was used to search Knowledge-based Oryza Molecular biological Encyclopedia database (http://cdna01.dna.affrc.go.jp/cDNA/Wblast2.html), and a full-length cDNA AK100117 (cDNA clone J023007E18) corresponding to LOC_Os09g22450 from rice variety Nipponbare (Oryza sativa ssp. geng) was identified. The rice EDS1 cDNA clone was kindly provided by RIKEN Yokohama Institute (Suzuki et al. 1997). Biomolecular fluorescence complementation (BiFC) assays were applied to study the interactions of OsEDS1 and OsPAD4 as well as their interaction with Arabidopsis AtEDS1 or AtPAD4 based on the previously reported procedure (Yuan et al. 2010). Open reading frames encoding OsEDS1 and OsPAD4 were obtained by PCR amplification from cDNA clones J023007E18 and J100075 L24 using the gene specific primers (Additional file 2: Table S1) and cloned into the vectors encoding pS1301-N-terminal region of yellow fluorescence protein (nYFP) or pS1301-C-terminal region of YFP (cYFP) to generate OsPAD4-nYFP and OsEDS1-cYFP constructs, respectively. Full length cDNAs encoding AtEDS1 and AtPAD4 were obtained by PCR amplification using Arabidopsis Col-0 variety leaf cDNA and gene specific primers (Additional file 2: Table S1) and cloned into the pS1301-nYFP or pS1301-cYFP vectors to generate AtPAD4-nYFP and AtEDS1-cYFP constructs, respectively. The constructs were co-transformed into rice (O. sativa ssp. geng) variety Zhonghua 11 stem protoplasts (Yuan et al. 2010). For BiFC assays in tobacco (Nicotiana benthamiana), OsPAD4-nYFP, OsEDS1-cYFP, pS1301-nYFP and pS1301-cYFP plasmids were transformed into tobacco plants via A. tumefaciens strain GV3101-pM90. The fluorescence was observed by confocal microscopy (TCS SP2; Leica). For the protein pull-down assay, full-length cDNAs of OsEDS1 and OsPAD4 were cloned into the pMAL or pCOLD vectors, respectively, and transformed into Escherichia coli strain BL21 to express maltose binding protein (MBP)-tag OsEDS1 (MBP-OsEDS1) and His-TF-tag OsPAD4 (His-TF-OsPAD4). Total soluble protein (10 μg) containing His-TF-OsPAD4 was incubated with Ni Sepharose™ 6 Fast Flow (17–5318-01, GE Healthcare) at 4 °C for 1 h, and then the beads were treated with 5% skimmed milk for 3 h at 4 °C to block them. The beads were washed 5 times and 5 μg MBP-OsEDS1 was added. The incubation continued for 3 h and the beads were washed 5 times. The beads were boiled in 1× SDS loading buffer and separated by 10% SDS-PAGE. The anti-MBP antibody (E8032L, NEB) was used to detect the MBP-tagged protein. Anti-His antibody (AE003, ABclonal) was used to detect input protein. For the complementation test of oseds1 mutant, OsEDS1 and AtEDS1 full-length cDNAs were placed behind a 2-kb OsEDS1 putative promoter, which was amplified from Zhonghua 11 genomic DNA (Additional file 2: Table S1). These constructs were referred as EWT and EAt, respectively. The OsEDS1 harbors the catalytic triad of lipase with the conserved serine, aspartate, and histidine residues (Brady et al. 1990). We substituted the conserved 143 serine (S) residue of OsEDS1 with leucine (L) using gene-specific primers (Additional file 2: Table S1), and place this mutated OsEDS1 gene behind the OsEDS1 putative promoter. The resulting construct was referred as ES143L. These three constructs were made using the pCAMBIA2301 vector. Subsequently, the constructs were individually introduced into Agrobacterium tumefaciens strain EHA105 by electroporation. The Agrobacterium-mediated rice transformation was performed using calli derived from the embryos of oseds1 mutant (Lin and Zhang 2005). To evaluate bacterial blight disease, rice plants were inoculated with Philippine Xoo strain PXO112 using the leaf-clipping method at the booting stage (Chen et al. 2002; Ke et al. 2017b). Disease was scored by measuring lesion length at about 14 days after inoculation. The bacterial growth rate in rice leaves was measured by counting the colony forming units (Sun et al. 2004; Ke et al. 2017b). To evaluate bacterial leaf streak disease, rice plant at tillering stage were inoculated with Chinese Xoc strain RH3 by the penetration method using a syringe (Ke et al. 2014). Disease was scored by measuring lesion length at about seven days after inoculation. To evaluate rice blast disease, one-month-old seedlings were inoculated with Chinese M. oryzae isolate Enshi2–2 (N2–2) by spraying method (Chen et al. 2003). Disease was scored according to Cheng et al. (2015). Rice plants growing in greenhouse until the 6-leaf stage were sprayed with 250 μM JA, 500 μM SA or solution (mock spray) containing 0.1% (v/v) methanol and 0.015% (v/v) Tween 20 until uniformly wet. The treated plants were kept in sealed plastic shade for two days and then inoculated with Xoo strain PXO112. Healthy rice leaves or leaf segments next to bacterial infection sites were used for RNA isolation and phytohormone quantification. Quantitative reverse transcription (qRT)-PCR was conducted using gene-specific primers (Additional file 2: Table S2) as described previously (Qiu et al. 2007). The expression level of the rice actin gene was used to standardize the RNA sample amount for each qRT-PCR. The expression level relative to control was presented. The same samples used for gene expression analysis were used for phytohormone quantification. JA and SA were quantified using an ultrafast liquid chromatograph/electrospray ionization/tandem mass spectrometry system as described previously (Liu et al. 2012). The statistical significance of differences between control and sample treatments were assessed using the pair-wise t-test installed in the Microsoft Office Excel program. The multiple samples were analyzed by one-way ANOVA using Tukey’s multiple comparison test in software R (The R project for Statistical Computing; https://www.r-project.org) as described by Deng et al. (2018). This work was supported by grants from the National Key Research and Development Program of China (2016YFD0100903), the National Natural Science Foundation of China (31501618) and the China Postdoctoral Science Foundation (2016 T90703 and 2015 M582239). The data sets supporting the conclusions of this article are included within the article and its additional files. YGK designed and performed most of the experiments, analyzed the data, drafted the manuscript; YRK helped to generate transgenic rice plants and analyze protein-protein interactions; XG, helped to analyze gene expression; MW helped to generate transgenic rice plants and Xoc inoculation; HL hormone quantification; SH M. oryzae inoculation; QZ, JX, XL provided biochemical and molecular analysis support and management; SW supervised the project, designed some of the experiments, interpreted data, revised the manuscript. All authors read and approved the final manuscript.